Aiming to bring high-end features to their budget end line-up, Samsung Sri Lanka launched four new smartphones. These are the Samsung Galaxy J6, J7 Duo & J4. Drawing inspiration from the flagship Galaxy line-up such as the Galaxy S8 and Galaxy S9, the new devices feature Samsung’s Infinity Display, giving users nearly 15% more display area without increasing the overall size of the device. This is due to a combination of extremely thin bezels and software powered in-display home buttons rather than hardware buttons. Further, the fingerprint sensor also moves to the back of the device for added convenience. These changes in the display hardware deliver an 18.5:9 aspect ratio giving users a better viewing experience and more browsing space. All four devices come with Samsung’s Super AMOLED display technology that produces deeper contrasts and delivers the most vivid viewing experience. Samsung’s ‘Chat Over Video’ feature allows an uninterrupted and uncompromised viewing experience while chatting. With the debut of the Galaxy J7 Duo, the dual camera makes its debut in the J series. Packing a 13MP and 5MP dual camera setup, the Galaxy J7 also sports a 8MP front camera. Both cameras come with f/1.9 aperture and LED flash, making the Galaxy J7 Duo an excellent smartphone for low light photography. Powered by an Exynos 7 series processor and backed up by 4GB of RAM along with 32GB of onboard storage expandable to 256GB via a micro SD card, the Galaxy J7 packs a 5.5” HD Super AMOLED display and a 3,000 mAh battery. The Galaxy J6 will feature a widescreen Infinity Display with aspect ratio of 18.5:9. The upcoming smartphone will flaunt a 5.6-inch AMOLED screen with a HD+ Infinity Display, an Octa-core Exynos 7870 SoC and will come with a dual-SIM & dedicated SD card slot option. The phone will have a 13-megapixel rear camera sensor along with an 8-megapixel front camera sensor with LED flash. The J6 will come with a 3000 mAh battery and run on Android 8.0 Oreo. 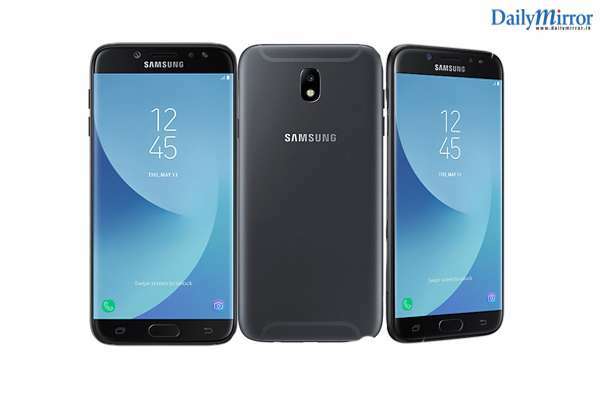 Lastly, the dual-SIM (Micro) Samsung Galaxy J4 runs Samsung Experience on top Android 8.0 Oreo and features a 5.5-inch HD (720×1280 pixels) Super AMOLED display. It also has a 1.4GHz quad-core Exynos 7570 SoC, coupled with 2GB of RAM and Mali-T720 MP1 GPU. The handset has a 13-megapixel rear camera sensor that supports full-HD (1080p) video recording and is supported by LED flash. On the front, there is a 5-megapixel camera sensor with an LED flash. Users have been provided with an ability to adjust flash intensity using three given levels of brightness. Further, there is a story feature that lets users create various stories from their previous memories by adding background music and easily share them on social networks. Samsung’s new lineup will be available from May and June from authorized resellers islandwide and also from JKOA, Softlogic, Singhagiri, Singer and Damro.